Francis Palma, Gary Michor, Greg Doucette – Screaming Power Inc., Picton, Ontario, Canada. The aim of this case study is to provide a panoramic view of existing GHG standards. This panoramic view includes (1) what is GHG emission estimation/calculation method used by each Canadian and major international body, (2) what are the online/offline tools they are providing for GHG emissions calculation, (3) if they are providing Web services or APIs for machine-to-machine communications that can facilitate GHG data sharing and educating individuals and enterprises on GHG, (4) if they provide open data free accessible by public users, and (5) if the calculations differ by various Canadian and major international bodies, why so. GHG standards from different bodies are focused on specific sectors or regions, and they are not the competitor of each other. Most of the cases standards rely on emission factors provided by IPCC (Intergovernmental Panel on Climate Change) for different fuel types with an exception for ISCC (International Sustainability and Carbon Certification) as it uses its own emission factors. Calculation methods also vary depending on the sector. Each standard may support multiple estimation methods. For example, all most all the standards support emission factor-based estimation, which is an approximation-based technique. However, the ECCC (Environment and Climate Change Canada), for example, also propose other types of estimation, e.g., Monitoring or Direct Measurement, Mass Balance, and Engineering Estimates. In general, it is not obvious that one can make a direct comparison to conclude any specific standard is better than others. Nevertheless, if one wants to calculate and compare GHG emissions from two properties located in two different countries/regions, he needs to make sure that he is applying country-specific emission factors for each fuel. There are certain online tools, however, there is no generic and complete tool available for GHG emission estimation regardless of regions/countries and sectors. Greenhouse Gas (GHG) is a gas in the atmosphere that absorbs and emits radiation, which increases the global temperature over time as the GHG in the atmosphere increases. This process is known as the greenhouse effect. The goal of this case study is to document commonality between standards and review ease of use of standards throughout the world in calculating GHG emissions. We look to see if there are differences in the varying GHG calculations when considering using the calculation on a single building footprint to manage its “carbon footprint”’. We also look at the reuse of the standards to consider management and baselining of a portfolio of buildings throughout the world. Primary greenhouse gases include Carbon Dioxide (CO2), Methane (CH4), Nitrous Oxide (N2O), and Sulfur Hexafluoride (SF6). There are 24 different types of GHG including those four major ones, 13 variations of Hydrofluoro Carbons (HFCs), and seven variations of Perfluoro Carbons (PFCs), which are known as the Kyoto Protocol GHGs. All these GHG have different global warming potentials (GWP). The GWP is a relative measure of how much heat a greenhouse gas traps in the atmosphere. It compares the amount of heat trapped by a certain mass of the gas in comparison to the amount of heat trapped by a similar mass of CO2. All the measures are done compared to CO2 since this is the most commonly emitted GHGs. GHG emission has harmful effects on our ecosystem and biodiversity. It has been estimated that all commercial buildings are responsible for around one-fourth of total GHG emissions. The GHG emissions are mainly from two areas (1) direct emission (e.g., oil, gas, etc.) and (2) indirect emission (e.g., electricity, district steam, district heating, district cooling, etc.). There is another category of emission that is based on biomass emissions. This can be caused by, for example, burned wood. In Canada, all parties who operate a facility with emitting CO2-equivalent GHG equal to or more than 50 kilo-tonne (kt) must report their total GHG emissions by June 1st every year. This is known as the reporting threshold. Anyone not crossing the threshold can optionally report their GHG emissions. In contrast to the GHG, there exists green power which includes solar, wind, geothermal, low-impact biomass/hydro resources. All these together represent renewable energy, which will also be touched on in this report. In reducing and–or managing GHG emissions, we need to objectively measure and find ways for comparison, but there are challenges in doing this. From a GHG point of view, different gases have different impacts on global warming. The GWP is an index which attempts to make these different impacts comparable by calculating the global warming impact over a period of 100 years of the different gases in comparison to CO2. Scientists, and in turn the calculations, aggregate all the gases into one category of ‘CO2-equivalent’, yet it is widely acknowledged that this faces many difficulties and challenges with accuracy, introducing some margin of error . This accuracy error further escalates in trying to measure GHG emissions. The IPCC guidelines on how to calculate and account for GHGs suggest that uncertainties for CO2 are up to 10% for electricity generation and industrial processes including cement and fertilizer production, and up to 60% for land use change and forestry. Electricity and natural gas consumption are often the largest sources of emissions within individual and corporate GHG inventories, and it is, therefore, important to report these emissions correctly. Unfortunately, it is common for reporting parties to misreport the emissions associated with transmission and distribution (T&D) losses . To further complicate things, there are issues in GHG emissions calculations at the national and international level. Recent BBC findings ,  show that several climate-warming gases are being emitted into the atmosphere but are not being recorded in official inventories. For example, air monitors in Switzerland have detected large quantities of one gas coming from a location in Italy but the Italian submission to the UNFCCC records just a tiny amount of the substance being emitted. As well, levels of some emissions from India and China are so uncertain that experts say their records might vary 100%. All these flaws pose a threat to the Paris climate agreement and automating the calculating of GHGs as commonality and standardization of calculating GHG and access to common data sets is still in its infancy. To properly calculate the GHG emissions a clear understanding of standards, their relationships, the similarities and dissimilarities among them is important. In this case study, we try to achieve these goals by presenting the standards in brief then compare them at a high-level. Our findings suggest that GHG calculations may vary based on the estimation methodology one follows and the default CO2-equivalent emission factors one applies. We also found that besides many natural and agricultural factors, human and manufacturing activities inside residential and industrial buildings play a major role in GHG emissions. This case study highlights key differences in each GHG emission estimation standard, i.e., how they estimate GHG emissions and why they vary in final emission value if a variance exists. The current Canadian GHG reporting requirements demand that all individuals and businesses who operate a facility that emits 50,000 tonnes of CO2-equivalent, i.e., the reporting threshold, or more of GHGs in the calendar year must report their emissions information to Environment and Climate Change Canada (ECCC). In general, the total GHG emissions are calculated as the sum of the total mass of each of the gases or gas species multiplied by their respective GWP. Like in the WRI standard for GHG emissions (as followed by EPA), the CO2 emissions from biomass materials must not be included in the threshold calculation. But if a party’s reporting requirements are met, the CO2 emissions from biomass combustion must be calculated and reported separately as part of its GHG information. Unlike the WRI standard, Methane (CH4) and Nitrous Oxide (N2O) emissions from biomass-related sources must be included in the reporting threshold calculation and reported as part of the GHG emission totals, to meet reporting requirements. As described in Section 1 and well documented in the ECCC guidelines, there are several methods for GHG estimation: (i) Monitoring or Direct Measurement – through continuous emission monitoring system, predictive emission monitoring, or source testing, (ii) Mass Balance – involves the application of the law of conservation of mass to a facility, process or piece of equipment, (iii) Emission Factors – estimates the rate at which a pollutant is released into the atmosphere as a result of some process activity or unit throughput, (iv) Engineering Estimates – involves estimating emissions based on engineering principles and judgment, using knowledge of the chemical and physical processes involved, the design features of the source, and an understanding of the applicable physical and chemical laws. However, the method in (i) and (iii) are the most commonly used for GHG emissions estimation. Accordingly, the general method to calculate GHG emissions is Emissions = Fuel Consumption X Emission Factor. The ECCC calculations cover the GHG emissions from general stationary combustion for example from fossil fuels, biomass, and other fuels listed in Table 20-1a. However, these calculations are appropriate for generation sites and may not suitable for energy use at the residential and commercial buildings. Since the tables providing emission factors are large, we put only their references here. The CO2 emission factors are available in the IPCC guidelines (Chapter 1, Table 1.4). Default emission factors for CH4 and N2O emissions from stationary combustion are also available in the same guideline (Chapter 2, Table 2.2 to Table 2.5) based on the type of industry. The RETScreen Greenhouse Gas (GHG) Emission Reduction Analysis Model found in the GHG Analysis worksheet of the RETScreen Software, helps the user estimate the greenhouse gas emission reduction (mitigation) potential of a proposed clean energy project. It calculates the GHG emission profile for a Base Case System (Baseline), and for the Proposed Case System (clean energy project). • Combustion produces not just CO2 but also methane and nitrous oxide. The RETScreen Software uses CO2, the most common GHG, as a common currency: methane and nitrous oxide emissions are converted into their equivalent CO2 emissions according to their GWP. International scientific committees such as the International Panel on Climate Change [IPCC, 1996] have proposed GWP factors for these gases. • The transmission and distribution (T&D) losses in electrical systems that feed into a grid must be considered. When electricity is generated in one place but consumed in another, a certain fraction of the electricity is lost as heat from the transmission and distribution lines connecting the two. Modern, industrialized grids tend to have losses of around 8% to 10%. Thus, electricity destined for a grid (i.e. not consumed directly on-site) produced by either the base case system or the proposed case system must include these losses when calculating the energy delivered to the end user. • The number of credits that accrue to the project may be reduced if a percentage has to be paid annually as a transaction fee to a crediting agency (e.g. the United Nations Framework Convention on Climate Change – UNFCCC) or the country hosting the project, or both. The GWP of a gas, or “GWP,” describes the potency of a GHG in comparison to CO2, which is assigned a GWP of 1. For example, a GWP of 310 for N2O indicates that a tonne of nitrous oxide is considered to cause 310 times more global warming than a tonne of CO2. The GWP for methane and nitrous oxide can be defined by the user (in the case of a “custom” analysis) or by the software (in the case of a “standard” analysis). The default values used by RETScreen can be found in the Revised Intergovernmental Panel on Climate Change (IPCC) Guidelines for Greenhouse Gas Inventories, 1996. Effective from 2016 new measures have been taken. Accordingly, the GWP of CH4 and N2O have been changed as shown in the following table. Table 1: Default GWP for Gases. The Government of Ontario follows the guidelines from Environment and Climate Change Canada (ECCC)  and the emission factor (EF) and GWP for each fuel are decided from the IPCC guidelines. However, ECCC also focuses more on various other sources of GHG emission including manufacturing, production, and–or generation. Some of these sources and their GHG quantification methods include General stationary combustion (ON.20), Primary manufacturing aluminum (ON.70), Cement manufacturing (ON.90), Electricity generation and cogeneration (ON.40), Glass production (ON.140), Iron and steel manufacturing (ON.150), Petroleum refining (ON.200). We are more interested in General stationary combustion (ON.20) which we discussed in detail in Section 2.1. Climate change from human activities is one of the key environmental issues. Controlling the emission of greenhouse gas (GHG) emissions would play a key role in limiting global warming according to the Kyoto Protocol signed in 1997. The United Nations Environment Programme (UNEP) provided a guideline for GHG emissions calculation that enables countries or companies with little or no experience to engage in the GHG estimation process, creating a common reporting platform. Two frequent categories that contribute to the GHG emissions are energy-related and process-related emissions. Therefore, to derive the GHG emission, they need to be assessed and calculated separately and then aggregated. The aggregated GHG value is then normalized using a measure of business activity. Here, the normalization is essential, which allows inter- and intra-organization comparison. The methodology used to estimate the GHG emissions is based on fundamental research by the Intergovernmental Panel on Climate Change (IPCC) for calculating the GWP of chemical species. The key to the estimation model is the conversion of all relevant emissions to the IPCC reference gas, i.e., CO2. Primary fuels include coal and natural gas whereas secondary fuels include refined petroleum products. The sources of data can be a utility provider, electricity bills, invoices for fuel deliveries, various meter readings (estimated from invoices if meter readings are not available), gas bills, the pipeline measurements, and various energy management software. To calculate GHG emissions from the combustion of fuels, UNEP guideline relies on an activity statistic (i.e., annual fuel consumption in tonnes) and an emission factor (i.e., tonnes of CO2 per tonne of fuel combusted). The calculation of the GHG emissions from coal depends on the net calorific value (NCV) of the fuel, which varies across the coal types, country, and region. Table 9 in  presents emission factors for different countries and missing countries rely on the default value for coal as shown at the bottom of the table. CO2 emissions from the most frequently used fuels can be calculated by finding the appropriate fuel consumption data in one of the units and then multiplying the fuel consumption by the appropriate factor from Table 3 in . CO2 emissions derived from the consumption of electricity are one of the single highest sources of emissions. Emissions from transport are broken down into two categories: Road Vehicle transport and Non-Road transport. The CO2 emission factors are presented in Table 3 and Table 4 in . Table 5 in  can be used for calculating GHG emission on driving mileage, which is useful when companies are renting transport for employees. Table 6  shows the CO2 emission factor for each person-kilometer for non-road passenger transports. Process-related emissions are from non-energy-related sources, i.e., industrial production processes, that transform materials chemically or physically. Process-related greenhouse gas emission is reported in tonnes and converted to CO2-equivalents using the GWP as presented in Table 8 in . The methodology for calculating GHG emissions in Portfolio Manager is based on the Greenhouse Gas Protocol Corporate Accounting and Reporting Standard developed by the World Resources Institute (WRI) and World Business Council for Sustainable Development. Most of the GHG calculation methods use “default fuel analysis approach” (DFAA), which considers primarily the type and quantity of the fuel. The DFAA is simple and straightforward in the calculation. However, the DFAA considers only direct estimated CO2 because the calculation with CH4 and N2O is complicated, as they not only depend on fuel characteristics but also on the combustion technology. In general, the amount of total GHG emission is calculated as the summation of direct and indirect emissions. Also, for counting each energy emissions of a site, we need to convert the total site energy value (for any fuel type) to its CO2-equivalent factor. Biomass emissions from buildings are similar to other direct emissions since they reflect emissions from onsite fuel combustion. Currently, ENERGY STAR Portfolio Manager® only tracks emissions from wood as the biogenic fuel. There is only one national factor for emissions from wood that is applied to the US, i.e., 94.22 kg of CO2eq Emissions/MBtu, which is 100.95 for Canada. However, the biomass emissions are not included in the total GHG emissions and are tracked down separately. In summary, two key metrics in ENERGY STAR Portfolio Manager measuring greenhouse gas emissions are (1) Total Emissions that measures the majority of GHGs associated with commercial buildings, which can further be split into component metrics like Direct Emissions (energy directly burned at a building — natural gas) and Indirect Emissions (energy burned after purchased from a utility — electricity) and (2) Biomass Emissions that are from biogenic fuels that are burned onsite, e.g., wood. Emissions are calculated by multiplying one’s site energy values by emissions factors. The ENERGY STAR Portfolio Manager® specifically focuses on US and Canada GHG emissions. Figures 1 to 3 and Figure 6 in  can be used to calculate direct and indirect GHG emissions for the US and Canada due to biomass burning and various energy use. However, using the IPCC emission factors similar estimation methodologies can be applied for calculating indirect emission, e.g., emissions from electricity use. ISCC recommends the segments that must report their GHG emission values include: (i) biomass producers; (ii) conversion units (e.g., conversion of solid biomass into liquid biomass or processing of liquid biomass); (iii) transport and distribution. ISCC suggests three options for reporting GHG information: (i) Use of default value as defined in the Directive 2009/28/EC and to apply these values they must be converted to CO2-eq emissions per Kg of the main product produced; (ii) Use of individually calculated values (“actual values”) calculated based on the calculation methodology from the Directive 2009/28/EC; and (iii) the combination of default value and individually calculated value. Overall GHG emissions of a bioenergy supply chain comprised of emissions and emissions savings. The GHG emissions from transport always need to be documented and included in the GHG calculations by the element in the supply chain that is receiving the product. Emissions from the distribution of the final product must also be considered and can be calculated according to the above formula. The emissions from the fuel in use eu can be directly calculated based on the emission factors suggested by the ISCC 205 document (see Section 6, page 26). The fuel amount is to be multiplied by their corresponding factors to get the amount of GHG emissions. For example, natural gas is used as the process energy, per kgCO2eq/MJth an emission factor of 0.07 is applied for an industrial furnace. This eu is also calculated and used as the part of the GHG emission calculation in ep. The choice of emission factors has a direct and definite impact on the results of the GHG emissions calculation. However, in the framework of the Directive 2009/28/EC, there is no official list of emission factors available which must be used. This is mainly because of the inconsistent literature on emission factors, the large variance of individual factors, and unavailability of emission factors for some inputs where an approximation is used. To avoid cherry picking and to assure that GHG emissions calculation is done based on transparent and verifiable emission factors, ISCC has developed a list of most relevant emission factors which should be used for all GHG emissions calculation and audits within the ISCC System. The complete list of various emission factors is available on ISCC website. The intended audiences of ISCC standard are biomass producers, conversion units (i.e., conversion of solid biomass into liquid biomass or processing of liquid biomass), and the transport and distribution sector. For most of the calculations, one needs the information on the yielded crop for the current year and the previous years average. Therefore, it is highly possible that the calculation methodologies proposed by ISCC are not applicable to household and commercial energy consumers including electricity and natural. These calculations well fit for GHG emissions for (1) land use for various purposes, (2) raw materials production, and (3) various processing related to agricultural activities. ISCC is an international certification system for Biomass and Biofuels, e.g., fuels and electricity. The choice of emission factors has an impact on the results of the GHG emissions calculation. In the framework of the Directive 2009/28/EC, there is no official list of emission factors available which must be used. The consistent literature on emission factors is limited, the variance of individual factors may be large and for some inputs emission factors might not be available at all or just an approximation can be used. However, to avoid cherry-picking and to assure that GHG emissions calculation and audit takes place on an objective, transparent and verifiable basis, ISCC has developed a list of emission factors. This list covers the most relevant emission factors. It should be used for all GHG emissions calculation and audits within the ISCC System. The list was developed based on experience from a two-year ISCC pilot phase and from the operational phase in 2010. The ISCC list of emission factors can be supplemented and/or amended. ISCC emission factors can be applied in a common way regardless of member countries. This GHG Protocol Corporate Standard covers the accounting and reporting of the six greenhouse gases covered by the Kyoto Protocol—carbon dioxide (CO2), methane (CH4), nitrous oxide (N2O), hydrofluorocarbons (HFCs), perfluorocarbons (PFCs), and sulfur hexafluoride (SF6). As this guideline suggests, the proposed GHG Protocol Corporate Standard focuses only on the accounting and reporting of emissions and does not require emissions information to be reported to WRI, WBCSD, or other bodies. In addition, while this standard is designed to develop a verifiable inventory, it does not provide a standard for how the verification process should be conducted. The WRI guideline categories the emission types in Direct GHG emission (from sources that are owned/controlled by the company) and Indirect GHG emission ( a consequence of the activities of the company but occur at sources owned/controlled by another company). However, the terms ‘direct’ and ‘indirect’ as used in this document should not be confused with their use in national GHG inventories where ‘direct’ refers to the six Kyoto gases mentioned above and ‘indirect’ refers to the precursors NOx, NMVOC, and CO.
To help delineate direct and indirect emission sources, improve transparency, and provide utility for different types of organizations and different types of climate policies and business goals, three ‘scopes’ (scope 1, scope 2, and scope 3) are defined for GHG accounting and reporting purposes. Companies shall separately account for and report on scopes 1 and 2 at a minimum. The defined scopes are (1) Scope 1: Direct GHG emissions — Occur from sources that are owned or controlled by the company, for example, emissions from combustion in owned/controlled boilers, furnaces, vehicles, etc. ; emissions from chemical production in owned or controlled process equipment. Direct CO2 emissions from the combustion of biomass shall not be included in scope 1 but reported separately. GHG emissions not covered by the Kyoto Protocol, e.g. CFCs, NOx, etc. shall not be included in scope 1 but may be reported separately; (2) Scope 2: Electricity indirect GHG emissions — Accounts for GHG emissions from the generation of purchased electricity consumed by the company. Emissions in Scope 2 occur at the facility where electricity is generated; and (3) Scope 3: Other indirect GHG emissions — An optional reporting category that allows for the treatment of all other indirect emissions. Scope 3 emissions are a consequence of the activities of the company, but occur from sources not owned/controlled by the company, e.g., extraction and production of purchased materials or transportation of purchased fuels. As the guideline suggested, the most common approach for calculating GHG emissions is through the application of documented emission factors. The emission factors are the calculated ratios relating GHG emissions to a proxy measure of activity at an emissions source. For most small to medium-sized companies and for many larger companies, scope 1 GHG emissions will be calculated based on the purchased quantities of commercial fuels (such as natural gas and heating oil) using published emission factors. Scope 2 GHG emissions will primarily be calculated from metered electricity consumption and supplier-specific, local grid, or other published emission factors. Scope 3 GHG emissions will primarily be calculated from activity data such as fuel use or passenger miles and published or third-party emission factors. There are two basic approaches for gathering data on GHG emissions from a corporation’s facilities: (1) Centralized: individual facilities report activity/fuel use data (such as quantity of fuel used) to the corporate level, where GHG emissions are calculated and (2) Decentralized: individual facilities collect activity/fuel use data, directly calculate their GHG emissions using approved methods, and report this data to the corporate level. In general, it is calculated that the produced or transmitted electricity has the emission factor of 0.2 t/MWh, e.g., a generation of 100 MWh electricity would do the emission of 20t of GHG. All the emission factors are considered from the IPCC guidelines. Within the inventory reporting requirements of the UNFCCC and the Kyoto Protocol, estimates of greenhouse gas emissions are produced for a number of sectors delineated according to process-technological characteristics. Amongst these are four main sectors: energy (fuel combustion); industrial processes, solvent and other product use; agriculture; and waste. Each of these sectors (for example, fuel combustion) may be comprised of individual categories (fuel combustion in transport) and sub-categories (fuel combustion in road transportation). Land use, land-use change, and forestry (LULUCF) activities also have the potential to help reduce emissions, as they seek to protect existing carbon stocks (for example, by reducing deforestation and land degradation), or to encourage new carbon stocks (afforestation/reforestation). The Kyoto Protocol restricts the accounting of the LULUCF sector, with net emissions relating to forest land management, cropland management, grazing land management and/or revegetation considered as optional in relation to inventory reporting requirements. As such, net emissions from LULUCF are treated as a memo item in greenhouse gas inventories and are excluded from the total emissions as used in relation to Kyoto targets. Data collection forms an integral part of any greenhouse gas inventory and is reliant on existing statistical sources. Emissions inventories do not ‘measure’ greenhouse gas emissions per se; rather, they ‘estimate’ emissions through the application of the 1996 IPCC guidelines which offer a range of methods. The simplest approach involves combining information on the extent of a human activity with a coefficient quantifying the emissions from that activity. Such coefficients are called ‘emission factors’. The general formula to calculate GHG emissions is Emissions = Activity Data X Emissions Factor. FAO follows the 2006 IPCC guidelines to estimate the GHG emissions. The 2006 IPCC Guidelines for National Greenhouse Gas Inventories (2006 IPCC Guidelines) were prepared upon the invitation of the UNFCCC, to provide good practice methodologies for countries to use in preparing GHG inventories when reporting to the UNFCCC. The GHG inventory sectors are Energy, Industrial Processes & Product Uses (IPPU), Agriculture, Forestry & Other Land Use (AFOLU) and Waste. The 2006 IPCC Guidelines are an evolutionary development with respect to the 1996 IPCC Guidelines, the GPG 2000 and the GPG-LULUCF 2003. The 2006 approach ensures continuity and enables experiences with the existing guidelines, new scientific information, and the results of the UNFCCC review process to be incorporated. One of the most significant changes between the 1996 and 2006 versions of the Guidelines is the assembly of Land Use, Land Use Change and Forestry (LULUCF) and the Agriculture sectors into a single AFOLU sector. The fundamental formula for estimating the quantity of GHG emissions can always be expressed as the multiplication of the activity data (AD) by the emission factor (EF) using the equation Activity Data X Emission Factor = Emissions/Removals. In general, FAO’s GHG emission estimation is more agricultural domain centric. In this document, however, we are more interested in the emissions from commercial and residential buildings and human fuel consumption. Therefore, the detailed calculations proposed by FAO on the GHG emissions related to AFOLU (Agriculture, Forestry and Other Land Use) – Land use, Forest land, Cropland, Grassland, Burning Biomass – are out of the scope of this document and are not discussed here. Interested readers are encouraged to go through . As the principal focus of GHG emissions calculation by FAO is on the land use, land use change and forestry, and the agriculture sectors, we do not detail the GHG emission calculation in this document. This is because our scope of GHG emission calculation is from household energy and commercial consumption. However, FAO provides a good collection of open data sets that can be explored and analyzed further, which we highlight in the following section. In the following, we make a high-level comparison among the GHG standards on different criteria. Emissions from Biomass Materials Included in The Main Emissions Calculation? Methane and Nitrous Oxide from Biomass Included in The Reporting Threshold? Suitable for Residential and Commercial Buildings? In this section, we assess each GHG standard, its estimation method, and the estimated value where applicable. The ECCC (Environment and Climate Change Canada) relies on IPCC (Intergovernmental Panel on Climate Change) guidelines for GHG inventory, thus ECCC uses the default GWP as suggested in the IPCC guidelines. The ECCC method could be applicable to residential and commercial buildings but it is more suitable for the generation sites that use hard fuels like coal. The ECCC estimation method not only measures CO2 emission, it also measures other GHGs like CH4, H20, PFCs, HFC, and SF6 with equal importance. Also, while calculating GHG emissions, the ECCC method calculated emissions separately for solid fuel, liquid fuel, and gaseous fuel and then add them up. One particular parameter in ECCC method is HHV (high heat value) which is the amount of heat produced by a complete combustion of fuel and it is measured as a unit of energy per unit mass or volume of a substance, e.g., measured as kcal/kg, kJ/kg, or Btu/m³. The ECCC provides several alternatives for estimating GHG emissions some of which relies on engineering measurements like Ratio of Molecular Weights (RMW). The ECCC does not provide any online tool or APIs for GHG emissions calculations. However, it provides open dataset which can only be achieved through search and browse. ECCC does not provide any APIs to access its provided open data either. The NRCan instead relies on the default GWP as suggested in the UNEP guidelines. The NRCan method could be applicable to residential and commercial buildings but it is more suitable for the natural sources of GHG emissions like land, forest, agriculture, and so on. The NRCan estimation method mainly focuses on CO2, CH4, and N2O in its calculation. NRCan (Natural Resources Canada) provides a comprehensive tool – RETScreen – as a clean energy management software system for energy efficiency, renewable energy, and project feasibility analysis as well as ongoing energy performance analysis. The RETScreen Expert is capable of GHG emissions estimation and weather normalization of energy data. However, the RETScreen Expert is currently available in viewer mode only. In RETScreen, the default GWP and emission factors are used as suggested by IPCC guidelines. NRCan provides a comprehensive energy use database but it does not provide any APIs or Web services to access these open datasets. The guidelines followed by the Government of Ontario (ONgov) is entirely same as ECCC. Therefore, we did not duplicate the discussion, neither the estimation method for GHG emissions. UNEP (United Nations Environment Programme) provides an all-encompassing GHG emissions computation method. All-encompassing in the sense that it considers not only individual fuel and electricity consumption, but it also includes transport and process-related emission figures in its GHG inventory. UNEP classifies the GHG emission into two broad categories: energy-related and process-related. UNEP relies upon its own emission factors for GHG calculation, for example, for natural gas it uses 0.0002020 tCO2/kWh (thus GJ or m3 units should be converted to ekWh or kWh) and for electricity, it uses 0.000163 tCO2/kWh. 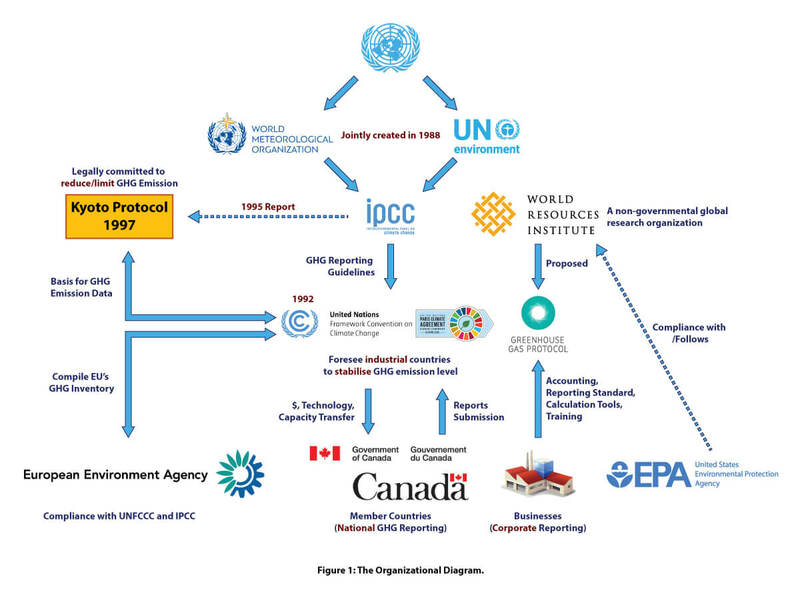 The UNEP is one of the highest bodies in GHG monitoring and controlling. Being a prominent international body for GHG, it provides rich sets of GHG and environmental data and RESTful Web services to access these data. However, UNEP does not provide its own GHG emission calculation tool since it focuses more on providing guidelines and mentoring other national and international public and private bodies. Since UNEP is an international body, calculations can be varied based on country-specific CO2 emissions factors for coal and electricity, through which same formula can be applied in different countries by varying emission factors. The EPA provided a methodology for GHG emissions estimation follows the WRI suggested approach. For the emission factors and US/Canada specific calculations, EPA relies on their proprietary algorithm called “Default Fuel Analysis Approach” (DFAA). The EPA provided estimation approach is one of the approaches that do not include biomass in the GHG calculations. This suggests that energy production and consumption style might become greener in recent days. The complimentary Web-based tool, called ENERGY STAR Portfolio Manager®, is mostly applicable to residential and commercial building energy uses. The main advantage of ENERGY STAR Portfolio Manager® is it provides a rich set of APIs to allow authenticated parties accessing their clients’ energy and property data. The guidelines provided by ISCC (International Sustainability and Carbon Certification, a European-centric organization) are mostly applicable to environmental and agricultural related emissions that require up to 20 years of yielded crops. Overall, it finds emissions from fertilizer production and fuel consumption in agricultural activities including emissions from waste water. ISCC also uses IPCC suggested emission factors. However, we did not provide the emissions calculations as the methodology is not related residential or commercial energy use. ISCC provides an Excel-based GHG emissions calculation tool, but no open data, neither any APIs to access their data. The ISCC standard is more focused towards agricultural and biomass emissions and requires information on yielded crops. The guidelines suggested by WRI (World Resources Institute) combine the emissions from residential/commercial properties with the emissions from land, agriculture, and process/transportation-related activities. WRI supports both the centralized (top-down) and decentralized (bottom-up) approach for the calculation of GHG emissions. WRI categories GHG emissions into three categories: direct GHG emissions (Scope 1), electricity indirect GHG emissions (Scope 2), and other indirect GHG emissions (Scope 3). The calculated value is highest among all other standards because it uses a very high emission factor of 0.2 tonnes of CO2 per MWh of fuel consumption. WRI provides open dataset on GHG emissions and multiple tools for GHG emissions calculations. WRI provides both cross-sector and sector-specific GHG emissions calculations tools. However, it does not provide any APIs or services to access their open data, i.e., users need to manually download the emissions data. The EEA is the European counterpart of EPA in the USA. EEA adheres to the UNFCCC and Kyoto Protocols for limiting and reducing GHG emissions. The calculations and emission factors EEA uses are from IPCC guidelines. Because all these three parties follow emission factors provided by IPCC. EEA does not provide any online tool, but a semantic search engine to search for energy use data. A Web service called GEMET exists to access the European energy use data. However, the service does not retrieve in any GHG emissions data. Lastly, FAO (Food and Agriculture Organization) is essentially focused on the GHG emissions from the agricultural, land use, and forest activities. Therefore, the residential and commercial buildings being our focus, the guidelines suggested by FAO is directly related to our purpose. Although FAO provides a rich set of food and agricultural emissions data for over 245 countries and territories. Interestingly, FAO provides services called FAOdata through which authorized developers are allowed to add, retrieve, update, delete, browse and search resources in the data.fao.org catalog through Web services in the RESTful and SOAP style. Again, likewise the ISCC, since FAO more focused towards agricultural and biomass emissions. This case study highlighted nine GHG emissions estimation standards (with several top international GHG/environmental bodies: WRI, UNFCCC, IPCC, FAO. etc.) to show their similarities and dissimilarities. In this case study, we are more interested in GHG emissions due to energy use in residential and commercial buildings. In a residential/commercial property, one’s carbon footprint is the total amount of CO2 (or any other GHG) that individual human activity generated and then released into the atmosphere through energy use of any kind within a given timeframe. The carbon footprint is usually calculated on a yearly basis and is measured in equivalent tonnes of CO2. Typical examples of CO2 emission sources from our daily life are the automobile (engine exhaust), home appliances that burn fossil fuels or use electricity, etc. But the estimation of CO2 is not as simple as the idea is. One needs to have a thorough knowledge of emission factors, the units of fuel being used, and various conversion factors to approximate the GHG emissions. The methods greenhouse gas (GHG) emissions estimations may vary depending on the sectors of emissions and even regions. The consumption-based measurement (also known as bottom-up and more related to imports) approach is the most common to use while there is also production-based measurement known as a top-down approach (more related to exports). In the production-based measurement, emissions are calculated not directly but indirectly from fossil fuel usage and other relevant processes such as industry and agriculture according to 2006 guidelines issued by the IPCC for GHG reporting. The two major GHG emissions estimation approaches are Emission Factor-based and Monitoring/Direct Measurement. In fact, estimation methods based on emission factors are more common than the monitoring or direct measurement, since it quite hard to directly measure them and very often they do not produce accurate results. Therefore, an exact measure depends on ‘more precise’ emission factors. Over time they may change depending on the type of energy/fuel, i.e., how greener they are in the production and transportation & distribution (T&D). For example, recently ENERGY STAR Portfolio Manager® changed some of their emission factors for some regions in USA and Canada, e.g., for Toronto, for electricity and natural gas. This is due to electricity in Ontario now being greener than a few years ago. All the calculations in this case study are done with latest available emission factors and GWP. As discussed in this case study, there are a number of standards and estimation methods/tools available. All these standards and estimation methods/tools came up from diverse sources of research. However, obtaining a uniform methodology for GHG emissions estimation is challenging and impractical. There are many factors involved including the regional average temperature, regional weather diversity, land use policies, agricultural production capability, fuel availability and usage pattern including the types of fuel people rely on, and last but not least the adoption of technology. In general, a developed and exporting country with higher population emits more GHG into the atmosphere due to its manufacturing industries. On the other hand, less/least developed countries in the rural area depend more on biomass which is a significant source of methane (CH4). Countries with livestock production face similar GHG emissions challenges. Overall, it’s hard if not impossible to obtain a globally accepted/applicable GHG emissions estimation methodology. It is difficult to find the right balance between emissions and development, to save the atmosphere and to prevent climate change. That is the main concern of many international bodies like IPCC, UNFCCC, UNEP, etc. These bodies are still disputing which countries are major players in GHG emissions. With the scarcity problem of a uniform and parameterized GHG estimation method, another fundamental obstruction exists with the lack of GHG data standardization for data sharing. Standards and international bodies hardly provide open APIs for sharing GHG data which could be very useful for educating individuals and businesses. This would also help in energy conservation and thus reducing GHG emissions. The ultimate success of this GHG reduction program largely lies on reducing the impact of climate change. Although standards and international bodies do not always provide open APIs for GHG data acquisition and sharing, they provide their own GHG emissions estimation methodologies, the calculation of which might vary. This variation comes from different emission factors for the same fuel type and—or due to the fact that internal mass or material types of the same fuel vary that are found and burnt in different regions. For example, the net calorific value (NCV) for coal varies according to the region it is found. The scientists found that China uses poor quality brown coal (found from its underground mining is the lowest grade of coal and its heating value is around one-quarter of black coal) which contains less carbon than higher grade bituminous coal and has more potential of emitting GHG to the atmosphere. Technical Guidance on Reporting Greenhouse Gas Emissions, December 2016, Facility Greenhouse Gas Emissions Reporting by Environment and Climate Change Canada (ECCC), Source: https://www.ec.gc.ca/ges-ghg/default.asp?lang=En&n=47B640C5-1&printfullpage=true. The GHG Indicator: UNEP Guidelines for Calculating Greenhouse Gas Emissions for Businesses and Non-Commercial Organisations, by Charles Thomas, Tessa Tennant and Jon Rolls, Source: http://www.unepfi.org/fileadmin/publications/cc/ghg_indicator_2000.pdf United Nations Environment Programme, Last updated on 2000. ENERGY STAR Portfolio Manager®, Greenhouse Gas Emissions, Source: https://www.energystar.gov/sites/default/files/tools/GHG_Emissions_August_2017_EN_508.pdf, Last updated on August 2017.
 International Sustainability and Carbon Certification (ISCC), 205 GHG Emissions Calculation Methodology and GHG Audit, Source: https://www.iscc-system.org/wp-content/uploads/2017/02/ISCC_DE_205_GHG-emission-calculation-methodology.pdf, Last updated on 2011. The Greenhouse Gas Protocol: A Corporate Accounting and Reporting Standard by World Resources Institute (WRI), Source: https://www.wri.org/sites/default/files/pdf/ghg_protocol_2001.pdf, Revised on December 2016. Greenhouse Gas (GHG) Emission Reduction Analysis Model in “Clean Energy Project Analysis RETScreen® Engineering & Cases Textbook” Source: http://publications.gc.ca/collections/collection_2007/nrcan-rncan/M154-13-2005E.pdf, by Natural Resources Canada (NRCan), Last updated on September 2005. Calculating Greenhouse Gas Emissions (Chapter 1) In “Using Official Statistics to Calculate Greenhouse Gas Emissions” by European Environment (EEA), Source: http://ec.europa.eu/eurostat/documents/3217494/5724229/KS-31-09-272-EN.PDF/16497950-fa38-465d-a1fc-fe6b50ac092c?version=1.0, EuroStat, 2010 edition. Guide: Greenhouse Gas Emissions Reporting, A guide for Greenhouse Gas Emissions reporting on Section 4(1) of Ontario Regulation 452/09 by Government of Ontario, Source: https://www.ontario.ca/page/guide-greenhouse-gas-emissions-reporting, Last updated on May 16, 2016. Estimating Greenhouse Gas Emissions in Agriculture: A Manual to Address Data Requirements for Developing Countries by Food and Agriculture Organization of the United Nations, Source: http://www.fao.org/3/a-i4260e.pdf, Rome, last updated on 2015. The difficulty of measuring greenhouse gases; Source: http://www.fern.org/pt-br/node/5188; Last updated on August 2010. Electricity: How to Correctly Report Emissions; Source: https://ecometrica.com/white-papers/electricity-how-to-correctly-report-emissions; Last updated on February 9, 2012, in Greenhouse Gas, White Papers. Matt McGrath, ‘Dodgy’ Greenhouse Gas Data Threatens Paris Accord, Source: http://www.bbc.com/news/science-environment-40669449, Last Update on 8 August 2017. Matt McGrath, China CO2 Emissions: ‘Coal Error’ Caused Wrong Calculations, Source: http://www.bbc.com/news/science-environment-33972247, Last updated on 19 August 2015.